This thread is about pre-registration for the smartphone version of FKG. Here is the official site for the smartphone version. Registration should make it so that your pre-existing data in the browser version of FKG will be linked with any of the smartphone versions you play. Also, everyone gets rewards based on the number of people who pre-register. 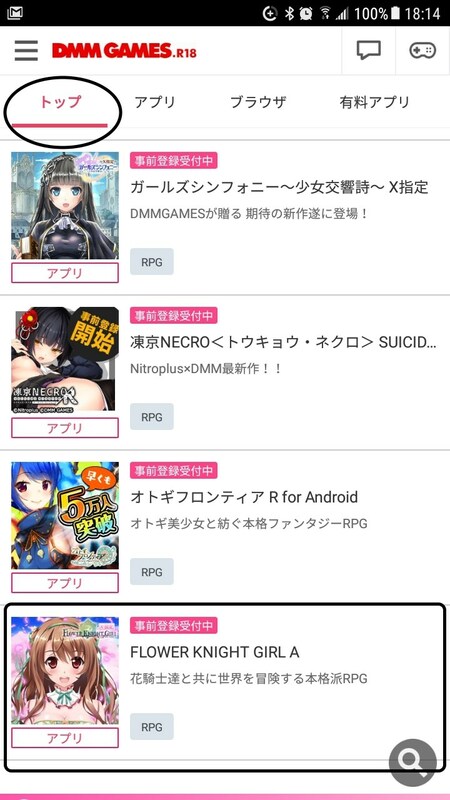 People already playing FKG (from DMM's site) are able to pre-reg from the DMM Games Store on smartphones. Even though the in-game data is already linked since it's the same platform, pre-registering counts towards the rewards everyone gets. Although your gameplay data will be maintained across all versions of FKG, your real money-bought currency can't be shared between the different platforms. Flower stones bought through Google Play, the App Store, and/or DMM Games Store can't be interchanged. However, the DMM Games Store version shares its premium currency, DMM points, with the browser version of FKG which is already around. The Google Play and App Store versions don't have R-18 scenes for 100% / 200% affection. The DMM Games Store version does. All three smartphone versions have fully voiced dating scenarios at 100% affection. This version requires the app called DMM Games to be installed on your smartphone. If the QR code doesn't work, try this instead. Install DMM Games from Google Play or whatever. Go to the Top / トップ tab, and look for Flower Knight Girl A in the Notable Pre-Release Titles / リリース前注目タイトル section. There will be a button to press labeled Pre-Release Registration / 事前登録 or so. Clicking it completes the process. Just make a Twitter account and Follow the public FKG account. Use the QR code and register this as a friend. Input your email address into the text box and click the Register / 登録する button. Any idea if any can be used outside of Japan? @ofi123 What is "it"? There's three different smartphone versions they intend to roll out. DMM Games Store and Google Play version might be region locked, but just installing their respective apks will bypass Google Play if you have to. So, does "everyone" mean "everyone that has registered for the mobile version" or "everyone who plays the game, regardless whether or not you pre-register for the mobile version" (I don't own a smartphone (not pro smartphone tbh)). Last edited by ofi123; 07-17-2018 at 09:07 AM. I wonder what kind of type this new 6* will be. Based on her appearance, probably Magic. Can't go wrong with more free stones. @TribalNugget I don't see her attribute written anywhere, but her bloomed abilities are publicized from the announcements. 1.2x Skill Rate for all based on individual affections. 20% Crit Rate for all. 25% Crit Dmg for all. 35% Atk for all in a boss fight. So basically she's a boss-oriented Aizoon Stonecrop. Crit + Skill Rate is a really powerful combo, so it should open a lot of doors for everyone. Anyone know how long pre-reg will be available for?